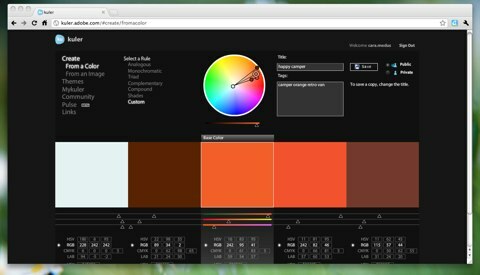 Kuler is a neat online colour palette tool that’s a lot of fun and a useful starting point for a lot of projects. 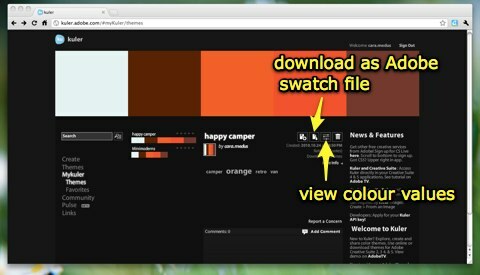 You can view themes – a collection of colours – that other users have created, and if you register you can create and save your own. The colour values page (see below) enables you to tweak the colours in an existing theme, or create your own from scratch using different colour theories or by uploading an image. I particularly like the option to create your own theme by picking the colours from an image. To create the theme shown in the screenshots I uploaded a screenshot of a website I liked – minimoderns.com. I saved it as a public theme called ‘happy camper‘, which you can view by clicking on the link. You can also download the theme as an Adobe Swatch Exchange file for use in Adobe Creative Suite Software.